“Timeless Desert home by noted regional Architect, Bennie Gonzales: spacious four-bedroom home, 3700+ Sq.Ft. located in the Town of Paradise Valley; a sublime interpretation of a desert-regional vernacular with a modern influence typical to these wonderful designs. This home features recent updates and a landscape designed by Christy Ten Eyck. A rare example of Mr. Gonzales’ work, this home was crafted in 1966 from hand mortar-washed block modulated to give adobe-like mass to the walls; one of just a handful of homes designed by this influential architect that remain in Arizona. But, where’s the house? Mostly in the landfill. We never got the chance to expose this home to someone who actually cared about any of that. 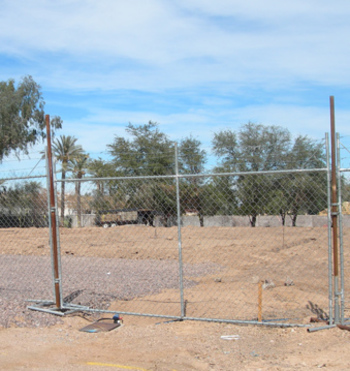 What someone saw, as is often highly typical in the destruction of architectural homes, was a building lot in Paradise Valley at a price that made economic sense. I saw this home get built. Prior to its construction, this area was our private desert playground. I was horrified I was to see a “development” go in. What changed my mind was seeing these houses by Mr. Gonzales. I fell in love with them. I enjoyed our new neighbors, and this particular house became home to a generous and lively family that we called friends. So what made this home disposable? It was of reasonable size and very good condition, offered materiality of great quality, great functionality and importantly, one with a rich architectural history and pedigree. Just what made it a SCRAPER? Greed? Well, absolutely at least a profit motive. A local penchant for massive homes of mediocre materials so large that they make an acre lot feel small? Sure. I mostly think it’s a lack of education. Who celebrated Bennie Gonzales architecture? Who pointed this home in the right direction, to the buyer that possessed a keen sense for design and space? Who priced this home to reflect its irreplaceable nature? Unfortunately no one. I’m a realist. Not every home and building can be saved or will last forever. But this home was not obsolete in a functional sense. Any shortcomings that made this home less desirable could have been easily overcome. As I write this, there’s a Gonzales on the market in the area and I fear for its continued existence. or what about the few remaining Al Beadle designs in PV? We regularly attend real estate meetings where someone routinely promotes a new listing as a “SCRAPER”. This translates into anything over twenty years old and smaller than 4000 square feet. Hmm. That’s about EVERY ranch-style or MCM home plus just about every Modern design prior to 1980. As for Historic in P.V., forget it. What’s left, and there’s VERY little, will probably be gone in ten years. Within the last two years I saw a 1920’s adobe guest ranch go away. The photo-caption that accompanied the pile of rubble in the local newspaper was laughable; “local group looking for history of home”. A little late! There used to be an original homestead from 1914 just off of Mockingbird near Cheney. It too is now gone. They reused some of the adobe blocks in the landscape, or so I’m told. I cringe at the thought of the architect-designed homes we have seen destroyed by this thinking. If this destruction continues what will we celebrate architecturally? A handful of public buildings and select post-war tract homes? As a morality story this is an example of why we do what we do at J&J. This is why in 1990, we followed our shared passion to research, present and support architecture and design in a manner that is respectful and promotes the art. These homes are a part of a cultural legacy that should endure. Thankfully, we have saved more than a few. We’ll work hard to save many more. Some owners don’t know what they have. Many buyers never find what’s available until it’s too late. We are here to help with that. But the hard fact is builders still watch the MLS every day. And a slower market means people are hesitant to take risks on a home that’s less than mainstream. He who hesitates is lost, or he who hesitates on BUYING Architecture may watch it get lost.